During a new project of mine, I needed a new kernel module for a device driver. I saw that there wasn't yet a condensed write-up on how to manage, compile and run your own kernel modules for the Omega2. So I decided to write one as a side-project. Here it is. Update 09.04.2018: Contains new section about reading hardware registers. 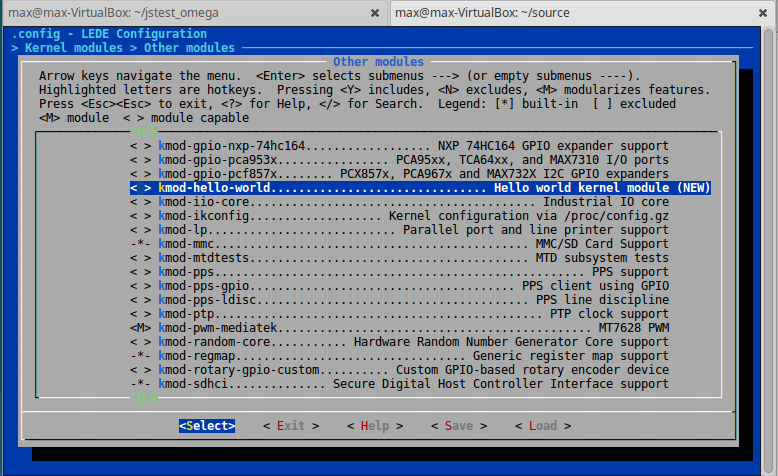 This is a tutorial on how to build and run Linux kernel modules (.ko files) for the Omega2. There are several related topics in this forum (e.g. here, here, here, here). However I didn't find any conclusive step-by-step tutorial on here that explains how to build a kernel module from the ground up. This is why I've created this tutorial to share what I've learned over the past few days which led me to a functioning kernel module compilation. This tutorial is working with the newest firwmare version b178, kernel version 4.4.74. You should also have kmod. Do opkg update && opkg install kmod if it isn't already there. Other prerequisites will be installed during the tutorial. What are kernel modules and why should you care? You can look at your loaded kernel modules by executing lsmod and get more info on a module by executing modinfo <module name>. The .ko files are stored in /lib/modules/4.4.74. For a project you might need a kernel module that is not included or distributed for the Omega2. As a first reference, you should look into Onion's package repository. This tutorial is for the case when you don't find your wanted module there or you want to build something new (e.g., peripheral drivers, ..). Where can we see what stock kernel modules and libraries we can build? For this, you need the cross-compilation environment first. This includes cloning Onion's source repository for LEDE-17.01 and building it. A tutorial can be found here. You should also have a basic idea on how to cross-compile a program for the Omega2. I built the toolchain within a Xubuntu VM. We can select a kernel module there and mark it with "M" -- meaning that this will build into a kernel module file. After exiting and saving the configuration you can build the module by executing make (with optional -j4 for 4-core multithreading). Where do these packages come from? They come from the package feed. The sources are defined in the feeds.conf and feeds.conf.default file. So they are just a bunch of links to git repositories where packages are stored. You can visit the links to see what's inside them. There are scripts inside the script/ folder to help you manage your feeds. -n :            List of feed names. Run ./scripts/feeds update -a to get all the latest package definitions defined in feeds.conf / feeds.conf.default respectively and ./scripts/feeds install -a to install symlinks of all of them into package/feeds/. Let's build a 'hello world' kernel module! Time to build the first actual kernel module. For security reasons you should first comment out every other feed in your feeds.conf and feeds.conf.default to prevent accidently updating everything (and to a new kernel version), using the # character. We will create a new src-link type feed using a folder on our host system as described here. We will take code and modified Makefiles from a tutorial here. A "hello world" test module for a tutorial. The top-level Makefile declares how to build our kernel module package. You declare the name, its files, a description, dependencies and other things there. See the documentation links at the bottom of this tutorial. The src/Makefile then adds all to-be compiled object files to the build process. Installing all packages from feed omega2_kmods. We see our new kernel module! Navigate to it and press M to mark it for compilation to a kernel module. Exit and save. max@max-VirtualBox:~/source$ find . -name "*hello-world*"
It conveniently compiled the hello-world.ko file and even created an ipk package. Unfortunetly, trying to installing that package will give you a kernel mismatch error because the kernel hashes differ (see topic links at start). Loading the .ko file directly will still work though. Transfer the file to your Omega2 over SSH/SCP. SSH to your Omega2 and insert the module. root@Omega-17FD:~# lsmod | grep "hello"
[11813.120524] Hello, world! We're inside the Omega2's kernel. Success! The kernel module was loaded and has executed the module init function successfully! At the end of this section you were now able to compile a simple kernel module from scratch and load it into the Omega2. Let's read a hardware register! Starting at page 48, the register addresses and meanings are listed in their respective blocks (system config, timer, GPIO, SPI,..). Let's have a look at the SYSCTL block. Starting at address 0x10000000, there are several interesting registers we can read out. Let's read out CHIPID0_3 and CHIPID4_7, which contains the ASCII chip name in these two 32-bit registers. If you were programming a microcontroller without a OS and memory management unit (MMU), you would just set a C pointer variable to that address and start reading from it. However, to read data from this physical memory address in the kernel, we first have to do a memory re-mapping. In an OS, you mostly deal with "virtual addresses", which are remapped by an MMU to real physical address within a memory chip. If we just set a C-pointer to 0x10000000 and read it, we would read this virtual address, which is no good. Virtual addresses are a whole topic on its own. You should consult a lecture on operating systems if you want to know more about this. max@max-VirtualBox:~/source$ make package/hello-world/compile -j4 && scp ./build_dir/target-mipsel_24kc_musl-1.1.16/linux-ramips_mt7688/hello-world/hello-world.ko root@192.168.1.202:/root/. [ 8402.279877] Hello, world! We're inside the Omega2's kernel. Great, we've read out the chip ID as "MT7628", just as the datasheet said. Convert the binary string from the datasheet to ASCII to confirm this. We also read out the expected values for the CHIP_REV_ID fields. 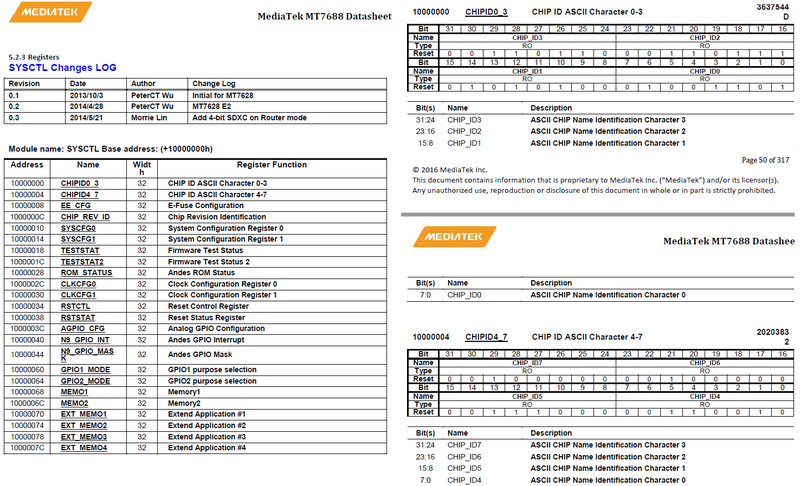 This simple example showed you how to read a hardware register as specified in the MT7688's datasheet from the kernel space. Let's build a XBox360 USB gamepad driver! Now let's do some more serious stuff. I have this Logitech Wireless Gamepad F710 laying around here. The USB device is detected, the driver xpad takes over and creates new device files /dev/input/event1 and /dev/input/js0 (Joystick #0). These are device files for the event-based API (new) and the older Linux Joystick API. What happens when we plug this into the Omega2? We can't really use the device this way. We're missing the xpad driver here, as well es the entire kmod-input-joydev package for the Joystick API. Luckily we can use our newly gained knowledge about kernel modules to get this thing working. A search for "linux xpad driver" leads to https://github.com/paroj/xpad and https://github.com/torvalds/linux/blob/master/drivers/input/joystick/xpad.c. I will use the code in the first repository, but the code for the newer Linux kernel should also work and support even more devices (206 of them). Adds support for various XBox360-layout USB gamepads. Creates /dev/input/eventX devices. If kmod-input-joydev is loaded, also creates /dev/input/jsX device. 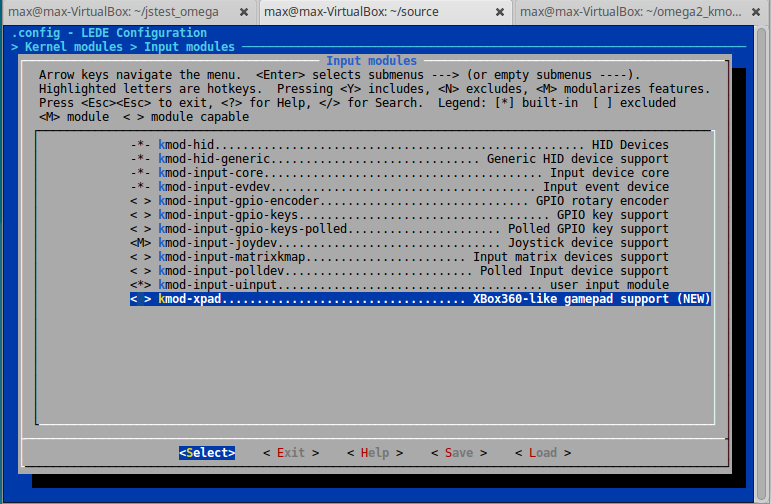 Go into make menuconfig -> Kernel Modules -> Input modules and select kmod-xpad and kmod-input-joydev with "M". Exit and save, then make. Find the kernel modules xpad.ko and joydev.ko and transfer them to your Omega2. max@max-VirtualBox:~/source$ find . -name "xpad*"
max@max-VirtualBox:~/source$ find . -name "joydev*"
Looks good. Let's examine /dev/input. Awesome :)! We have /dev/input/js0 and /dev/input/event0 now! 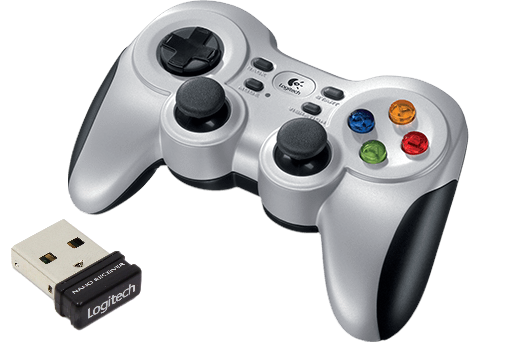 Input device name: "Logitech Gamepad F710"
This works and shows every gamepad event on the screen. Now lets use a library which uses the Joystick API. We download the gamepad.c, main.c and gamepad.h files in a new folder and modify the Makefile with which we cross-compile the program. Note that this uses libncurses and libudev. Select libncurses in the menuconfig and build. Getting libudev and libevdev is more complicated because you actually have to update to the newest LEDE feeds to select that package. Just download a binary version and from here. Also don't forget to install the dependencies on the Omega 2 by doin opkg update && opkg install libncurses libudev kmod-input-evdev. Download the Makefile from here. Building gives you libgamepad.so (with symlink to libgamepad.so.1) and gamepadtest. Transfer them and libevdev.so.2 to /usr/lib and /root respectively. Joystick 0 is correctly detected and all sticks and buttons are working flawlessly! Now we can work with this library to program an application that uses an Xbox360 USB gamepad. This concludes the practical part of the tutorial. @luz has a repository for self-built packages and kernel modules at https://github.com/plan44/plan44-feed. The Makefile are very useful. This tutorial showed you what kernel modules are, why we might need them and how to build them. We built a 'hello world' minimal kernel module for a start, then expanded the code to read a hardware regster. Finally, we built kmod-input-joydev and xpad to get a USB Xbox360 gamepad working. We then compiled a test program and a library to confirm that we gamepad works. My toolchain environment has only feeds.conf.default file but feeds.conf not exist. It's ok?. @Oximoron Thanks! That's weird, but should be fine too. If you cloned https://github.com/OnionIoT/source you should have that file. Anyways, I think I saw the update process etc. only pulling info from feeds.conf. I said to modify both files just to be certain you don't do an accidental upgrade and upgrade to a higher kernel. For the modules to work you should use that toolchain and kernel version. I experienced problems when compiling for a higher version kernel and running it on an older one. thank you. it will be very helpful. Great series, and great tutorial! make: *** No rule to make target 'package/hello-world/compile'. Stop. I have successfully done a full build and installed this module on my Omega2+, but I am stuck at this point. @Jackson-Wilson Thanks for the feedback! Unfortunately I cannot reproduce that. make: *** package/hello-world: No such file or directory. Stop. make: *** No rule to make target '/package.mk'. Stop. Could it be that you set-up the paths the wrong way (src-link)? Are you executing the command from the from the right path (top-level in source)? Very weird that normal make -j4 works but this doesn't.. Any differences to the OnionIoT's source repository setup or the package folder structure here? What does make package/hello-world/prepare -j1 V=s do? However, when I make a change to the source file, and try to re-build, make says the package is "up to date." Maybe someone more savvy with the innards of the build system can tell me how to get a quick re-build of this package as I make changes along with this guide. make: *** No rule to make target 'package/hello-world/clean'. Stop. Good that you figured out another way. The only difference I see is that I placed my omega2_kmods folder outside of source in some other directory (/home/max/). Well, my work-around doesn't allow me to clean and rebuild this single package, so I'm still struggling to get this to work. I have tried to replicate the structure you describe in this guide. I get the same "No rule..." error for /clean and /prepare commands as well.